Unpack once…spend less time traveling and more time adventuring! Located in the heart of all southwest Montana has to offer, make Ennis your springboard to adventure. Day Trips from Ennis are convenient, unhurried and offer experiences for everyone. Mix and match these suggestions and put together your own extended stay vacation! Float and fish the incredible Madison River. 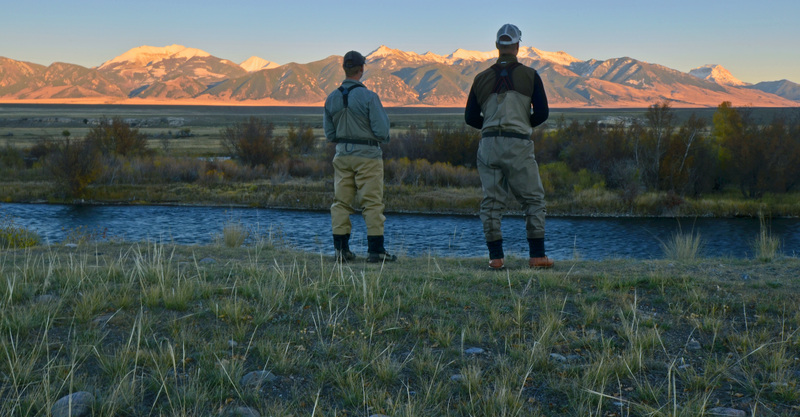 This is a “must do” for all fisherfolks who love being on scenic water, watching wildlife and fly-fishing for beautiful Rainbow or German Brown Trout. Local guides provide a complete fly-fishing experience. If possible, plan ahead by contacting The Tackle Shop or other local guide services to book your river trip. End the day with a great dinner at the classic McAllister Inn Steakhouse. 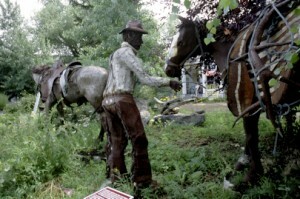 Get a feel for the Old West and visit Historic Virginia City and Nevada City. This Montana State Park is filled with treasures, ghost stories and gold rush fever alive in a semi-ghost town that was once the state capital of Montana. Grab a discount pass and get going! 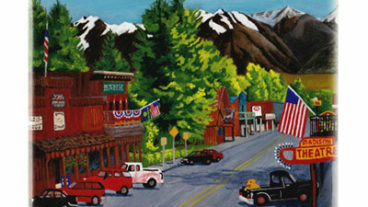 Ride the train to Alder Gulch, pan for gold, shop in unique gift and specialty shops and treat yourself to home-made ice cream and an old-fashioned candy shop. Take a ride on the fire truck and learn the fascinating history of this little town that time forgot. Later, attend a live theater show with the Virginia City Players or Brewery Follies. A great family-fun day with wild west history thrown in! Day Trip #3 – Outdoor Hiking/Riding Action and In Hot Water! Today is as Backroad Montana as it gets! Start your day with a horseback or hiking adventure in the Beaverhead National Forest. Head “up Jack Creek” to the Diamond J Corrals for a trail ride or park at the trailhead for a beautiful day of hiking in the shadow of the Spanish Peaks and Lone Mountain. Wildlife may be spotted while you picnic along Jack Creek or dip a rod for Brook Trout. Of course, all this fresh air, sunshine and altitude will restore your soul, but wear out your body. No problem! 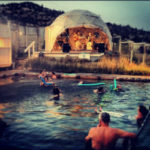 A short drive north on US 287 to Norris and the Water of the Gods natural hot springs will fix you right up. Great organic food, beer, wine and folk music – perfect! Stay close to home base. Start your day with a great breakfast at the Ennis Pharmacy followed by a round (or two) of golf at Madison Meadows Golf Course – call ahead for tee times. With a hearty appetite, time to have a real homemade lunch at the Pic-a-nic Basket. At the end of it all, the Alley Bistro is ready to take your pizza order for take-out. Visit the 287 Gallery while you wait. Or dine-in and have a casual dinner with a wide-ranging menu. Sleep a little late and stop at the Pic-a-nic Basket for a breakfast sandwich or delicious homebaked pastry. Now is a great time to stroll check out the shops on the Ennis Main Street. We love Cabin Creek, The Trading Post, Plain Janes and Benji’s for gifts and clothes. There is a great art scene in Ennis! Visit the Riverstone Gallery and take in the amazing outdoor sculptures on the Ennis Art Walk Round out the day with a stop at Willie’s Distillery and try the cocktail of the day and listen to some live music. The Gravel Bar is just across the street when hunger hits again! 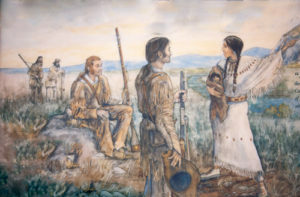 Have a Lewis & Clark adventure today! Put on walking shoes and throw water and snacks into your backpack and drive north about 45 miles on US Hwy 287 to MT Hwy 2 and follow the signs to Lewis & Clark Caverns State Park. 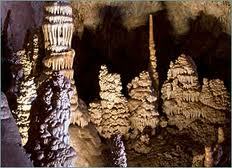 Viewing the caverns is especially fun for kids because it involves some climbing and scrambling in a really cool place. After a tour of the caverns, grab a snack and get back on the road (US Hwy 287) to Three Forks. A great lunch stop is the Wheat Montana Bakery at the intersection of US Hwy 287 and I-90. Once everyone has refueled, the next stop is the famous Lewis & Clark discovery of the headwaters of the Missouri River at Missouri Headwaters State Park. The Madison, Gallatin and Jefferson Rivers converge here. It was a significant milestone in their epic journey. Your day might include a dinner at the Pompey’s Grill in Three Forks – reservations suggested. Returning to Ennis will take about an hour from Three Forks with great sunset views from the top of Norris Hill. Today’s adventure includes history, landmarks, shopping and fine dining with a round trip of just under 200 miles. Head out of town on State Hwy 287 (not to be confused with US Hwy 287). Pass through Virginia and Nevada Cities (Day 2) and continue through the wide open Ruby Valley to Twin Bridges. Keep an eye out for pheasants, cranes, and turkeys along the road. Just an hour from Ennis is Bozeman, Montana. The population is nearing 50k, so it is not a BIG city, but it is a pretty nice place to spend a day – if you like that sort of thing! There is lots of information on Bozeman, but the Museum of the Rockies is excellent and the Downtown Main Street area has good energy and lots of shops and dining. It is an easy day of driving as you go through Bear Trap Canyon and enjoy the views. The return trip offers a late-day vista at the top of Norris Hill with sunset on the Madison Range that is breathtaking. Stock up on groceries, get a fast-food fix and then come on back to the real Montana. Include a visit to Yellowstone National Park before, during or after your Backroad vacation and have all the fun with fewer crowds. On your Backroad to Yellowstone route, plan time to explore the Quake Lake Geological Area and Visitor’s Center. This astounding story of disaster and survival is well documented and provides a chance to take short hikes along the drive beginning about 40 miles south of Ennis on US 287. Worth a stop for breakfast or lunch is the Campfire Lodge. There is also great fishing and hiking options in this area. To fully enjoy the Day Trip ideas here, we recommend at least 4-5 days on the Backroad to Yellowstone. Ennis offers a wide range of lodging, restaurants, and services. Select lodging with a kitchen or visit our excellent local restaurants. Camp at a State Park or choose a luxury log cabin with all the services. Park your RV and drive. Whatever your style and budget, the Madison Valley is the perfect place to settle in for plenty of vacation action.